Our 100% organic pressed product has a neutral odor, flavor and color, making it suitable for a huge variety of uses. 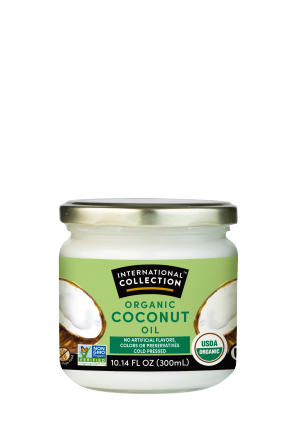 The health and lifestyle benefits of pure coconut oil has won devotees throughout the world. Coconut oil has a smoke point of 400°F, making it suitable for high-temperature cooking such as sautéing, without impacting on the quality of your food. It is also perfect for both sweet and savory baking, as well as for frying eggs, making popcorn and glazing vegetables. The popularity of coconut oil is also driven by health benefits, including promoting healthy skin and hair.